I would like to think that I’m pretty good at being able to roughly estimate the correct amount of food needed to feed a group of people. But in reality, I always get a bit scared and make more food than I need. That pretty much makes Thanksgiving my perfect storm. There’s a bunch of different dishes, hungry people, and an intense pressure to cook a lot of food. If anyone can make it through Thanksgiving without leftovers, they should get a medal. It’s almost impossible. It doesn’t help the problem that turkeys come in fifteen pound increments! So I anticipate that there just might be some turkey leftovers floating around in the next few weeks and I recommend that you bookmark this quick recipe for Turkey Breakfast Tacos to use up some of them! These delicious breakfast tacos come together quickly using a few things that you might have left over after Thanksgiving. 1) Wash potato well and cube it into 1/4 inch cubes. 2) Add a good drizzle of olive oil to a large skillet over medium-high heat. Once hot, add potatoes and cook until they start to crisp up, about 10 minutes. 3) Season potatoes with a pinch of salt and pepper and some paprika. 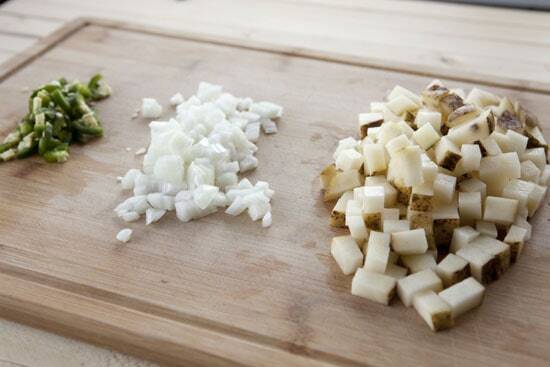 4) Add onions and jalapeno to the skillet and continue to cook for a few minutes until veggies soften. 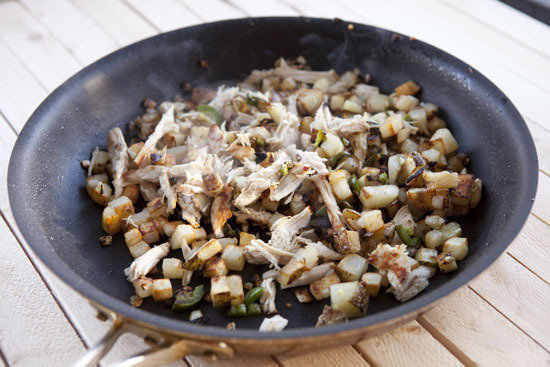 5) Roughly chop leftover turkey and add it to the skillet. Continue to cook. 6) Warm a few flour tortillas in the microwave. 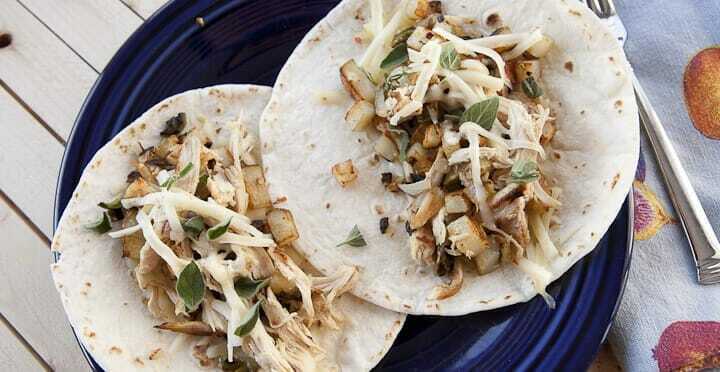 7) Add grated cheese to tortillas and scoop in some of the turkey filling. 8) Garnish with hot sauce, fresh oregano or thyme, and serve immediately! 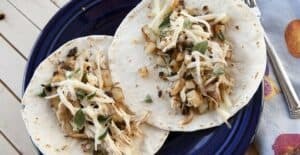 I tried to use veggies for these tacos that you also might have around after Thanksgiving. Maybe you have an extra potato or two and half an onion? It’s not unreasonable to think that you might have a chili pepper of some sort sitting in the fridge also. So you can just dice all that stuff up! A clove or two of garlic would work as well. 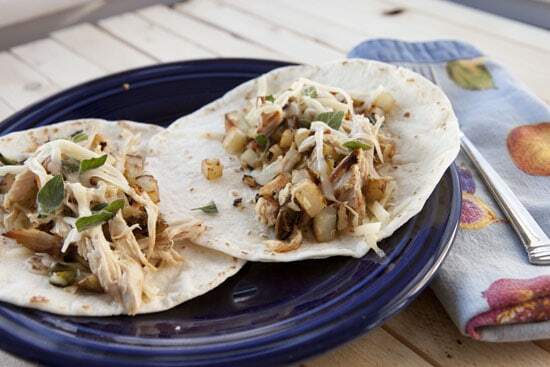 The only real trick to these Turkey Breakfast Tacos is to make sure you cook the potatoes first since they take way longer to cook than anything else. Add a drizzle of oil to a large skillet and get it hot over medium-high heat. 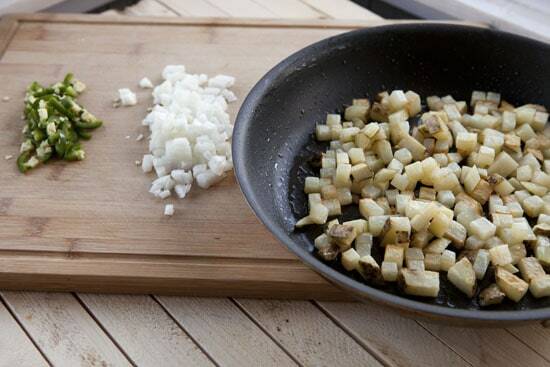 Then add your cubed potatoes and let them cook until they start to get crispy, about 8-10 minutes. Season the potatoes as they cook with salt and pepper and maybe a pinch of paprika. Once the potatoes are nicely crispy, you can add in your onions and pepper and you won’t have to worry about burning them while you wait for the potatoes to cook. I recently had a sort of testing Thanksgiving and that left about two pounds of turkey in my fridge. I used a mix of white and dark meat for these tacos and roughly chopped it up. Add the turkey in with the veggies and toss everything together. The turkey should warm up quickly and even crisp up a bit on some parts which is a bonus. This was my finished skillet – ready for tacos! Microwave your tortillas for a few seconds just to soften them up and then add some grated cheese to them. 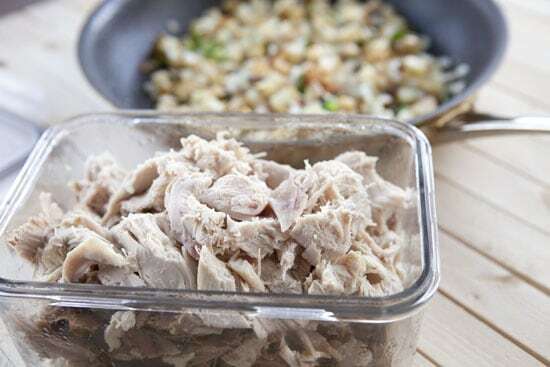 Pile on the turkey mixture and garnish with some fresh herbs that you will almost certainly have left over as well. I used oregano, but sage or thyme would work well also. There’s no egg in these Turkey Breakfast Tacos, but they are still plenty substantial. If you wanted to get super-crazy, you could ditch the cheese and pile on some leftover cranberry sauce. If you are planning on cooking a bird for Thanksgiving this year, plan on making these over the weekend after Thanksgiving! What a great idea! They look/sound delicious. These look awesome! They’re a nice change from the typical leftover turkey sandwich! Hmm..I think I will do this with corn tortillas using your hard taco technique. This is going to be amazing for the left over smoked turkey I am having for thanksgiving. Keep the turkey left over ideas coming! I always make twice what I need. As a lover of savory breakfasts but NOT a lover of eggs, I love seeing new savory breakfast ideas that aren’t full of eggs. This looks delicious!